Thank you to everyone who participated in Deep Vein Thrombosis (DVT) Awareness Month and helped spread awareness of deep vein thrombosis and its potentially fatal complication pulmonary embolus (PE). Please help us continue to spread awareness year-round so that we can prevent DVT and PE. You are always welcome to refer people to ClotCare for answers to their questions about deep vein thrombosis, pulmonary embolism, and related issues, and, of course, if you have any questions, please let us know via email at webmaster@clotcare.com. March is Deep Vein Thrombosis Awareness Month! Deep Vein Thrombosis (DVT) Awareness Month is a multi-faceted campaign aimed at raising awareness among consumers, healthcare professionals and policy-makers about DVT and PE on a national and local level. Click here to learn more about Deep Vein Thrombosis Awareness Month. All Month DVT Awareness by Design - Show us Your Socks! 3/22/2007 Lecture - Venous Thrombosis and Cryptogenic Brain Embolism: Linked at Heart? 3/29/2007 Lecture - Venous Thromboembolic Events: What's different about kids? 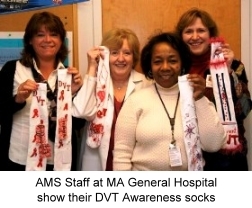 DVT Awareness by Design - Show us Your Socks! The Coalition to Prevent Deep-Vein Thrombosis (DVT) is inviting you, healthcare communities and individuals across the country to participate in DVT Awareness by Design. DVT Awareness by Design is a visual way for people to show their support and increase awareness for DVT. 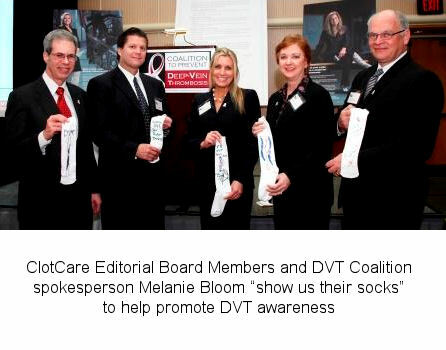 We hope that by designing a sock and wearing it proudly during DVT Awareness Month in March, you will serve as an ambassador in your community to educate colleagues, patients, friends and family about DVT care and treatment. DVT Awareness by Design goes beyond building awareness of signs and symptoms by actively empowering healthcare communities and individuals to show their support through designing and personalizing their own socks, to showcase what DVT means to them. Together, we can provide meaningful education and information that is both engaging and effective in raising awareness for a condition that affects up to three million Americans annually. Be sure to take a picture of yourself wearing your DVT Awareness sock(s) and send it to the DVT Coalition to be posted in the DVT Awareness by Design Photo Album. 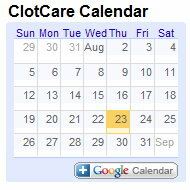 You are also welcome to send your pictures to webmaster@clotcare.com, and we will post it in our photo album. If you email us your picture, you are also welcome to include a suggested caption. Special Note for Healthcare Professionals: The DVT Coalition has DVT Awareness by Design Kits and DVT Awareness Public Service Announcement posters available for use in your healthcare communities. For more information, click here to visit the DVT Awareness by Design website for healthcare professionals. We invite you to help spread awareness by posting fliers about Deep Vein Thrombosis (DVT) Awareness Month in your clinics and communities. Please only post these fliers in places where you have permission or authority to do so. The flier includes important facts about DVT and ClotCare's Web address so that interested individuals know where to get more information. Click here to download the flier. Note that the flier is a pdf document. If you have any trouble with the download, please let me know at webmaster@clotcare.com. Chat online with ClotCare's Senior Editor, Henry I. Bussey, Pharm.D., FCCP, FAHA. The purpose of this online chat is to allow you to ask Dr. Bussey your questions about deep vein thrombosis. The chat will begin at 7 PM Central Time, but you are welcome to join late. On the day of the chat, simply come to this page and follow the link provided to join the DVT Chat. Click here to read the DVT/PE Chat transcript. Prior to the online DVT chat, I encourage you to review ClotCare's posting about Understanding Deep Vein Thrombosis (DVT). For more information, click here to download a flier about the lecture series or contact the Hemophilia Office at 212-746-3418 or by email at sup2006@med.cornell.edu. The National Alliance for Thrombosis and Thrombophilia (NATT) invites you to attend a free education seminar on blood clots and blood clotting disorders. The seminar will be held Saturday, March 10, 2007 from 8:00 AM to 4:00 PM in Albuquerque, NM. Click here for complete details about this free seminar on blood clots such as DVT. Harry L. Bush, Jr., M.D. Venous Thrombosis and Cryptogenic Brain Embolism: Linked at Heart? Jorge R. Kizer, M.D., M.Sc., F.A.C.C. MSU Center for Bleeding and Clotting Disorders is offering a free educational day about blood clots. The seminar will be held on Saturday, March 24, 2007 at Michigan State University in East Lansing, MI. Click here for complete details about this free seminar on blood clots such as deep vein thrombosis (DVT). Who is at risk for deep vein thrombosis (DVT)? What are the symptoms and treatment options of deep vein thrombosis (DVT)? Can deep vein thrombosis (DVT) be prevented? For more information, click here to download a flier about the lecture series or you may call 212-746-3418 or email sup2006@med.cornell.edu. Venous Thromboembolic Events: What's different about kids? The talk will cover the risks, causes, diagnostic modalities, and treatment of thromboembolism in children, emphasizing the differences which exist between adults and children.